This post is a continuation of this one, a look into the various Xeno species that inhabit the Earth alongside Humanity. But while Toxic, Vamps and Wolfhounds can sometimes pass for human, these ones never can. They are classified as 'Blackout Risks' because their mere presence outside of secure areas can endanger the Masquerade. After all, some Xenos can pass for human at first glance. But if you saw any of these ones, you would recognize that you weren't in Kansas anymore. Beautiful, austere, and absolutely ruthless. The harpies are beautiful, ancient creatures of unknown origin. They look a bit like humans in that they are humanoid, but they diverge radically from humans from their. Harpies are covered in tiny scales dyed either in normal human skin tone or brilliant neon colors. In the case of the former, these scales are indistinguishable from skin at a distance. Additionally, all Harpies have enormous, multi-colored wings. Harpies also have small, delicate claws on their fingers. Their feet are more like that of a bird, three fingers tipped with talons. Additionally, Harpies are not a sexually dimorphic species. They seem to not reproduce at all, all possessing androgynous forms. They do not seem to age. The name Harpies was given to them by the Greeks, as that is when the first reports of them began to emerge. Whether they appreciate this label is unknown, but today it is accepted as common. Harpies have been around for a long time, and while each individual Harpy is different, there are certain things that hold true for all Harpies. First, Harpies are usually very solitary creatures, generally existing in small pairs or trios, but usually no more. They seem to enjoy company, but they never talk about themselves. All questions about the origins of the Harpies, how they reproduce, and their history are generally ignored. Threat Level: 6-5. Because of their lack of social organization (or society in general) and rarity, Harpies do not pose a significant threat to Humanity, except in small groups. For while even a young Harpy is is as strong as a bull, can fly and has sixteen razor daggers at their disposal, they are not immortal. A Harpies' scales are strong enough to reflect most bladed weapons and bludgeoning weapons, but someone with a decently strong Semblance or a lucky shot could pierce their armor. If you must engage a Harpy in combat, recall that the ones who have survived to the modern day are the strongest and luckiest of their kind. But also remember that a Harpies' greatest strength comes not from their natural attributes, but from their intelligence. Even a lowly Harpy is unimaginably cunning, so approach with extreme caution. But perhaps because of their long-lifespans, Harpies tend to be well-behaved. The biggest problem most Harpies cause is that they endanger the Masquerade by flying around and getting spotted, fueling conspiracy theories and paranormal forums. Many Harpy sightings are explained away as Mass Hallucinations. - Do not breed with 'the daughters of men'. Failure to do so will result in extermination. No one had heard of the Lochs until 1920, in which a struggling poet by the name of H.P. Lovecraft stumbled upon a small fishing town in the dismal reach of northern Maine. There he found darkness, madness, and suffering, a paper town where the humans were enslaved to a race of diabolical fish-men. They apprehended Lovecraft and interrogated him, and when they were convinced of the poet's harmlessness, they decided to kill him. But Lovecraft managed to escape, and made it back to Providence, Rhode Island. From there he began talking to everyone he could, trying to convince people about what he had seen. Most people were skeptical, but word managed to reach the local API Agnet-in-Charge. The Chasteners visited Lovecraft and told him he had suffered a nervous breakdown, and that their was nothing in Northern Maine. And while Lovecraft did stop talking about what he had seen, he would spend the rest of his life hunting for more evidence of these fish-men and associating with Those who Knew. Additionally, while he feared API enough not to publish his findings as fact, he did write fiction that was heavily based off his own experiences, and the experiences of others. 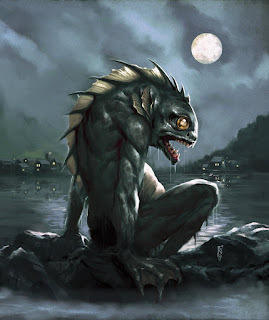 And while some things in the Cthulhu Mythos are certainly the creation of his own twisted imagination, the Deep Ones were definitely inspired by something very real. API would then spend the next few years chasing reports of these fish-men, fighting a guerrilla war against a foe they did not understand. Additionally, it was discovered that these fish-men, who later became known as Lochs, were not only intelligent, but came from a highly advanced civilization. They did not possess certain human technologies, but they were quick to adapt them. And this situation would have likely continued had the Second World War not broken out, thus entangling much of API in a magical war that rent the Masquerade and the Peace to shreds. In the meantime, with the majority of API distracted fighting on various fronts or against the Xenos who decided to use this an opportunity to run rampant and destroy everything in their path, the Lochs were able to raid shipping lanes and coastal settlements at will. But the War eventually ended, and API was through with half-solutions. But they could not follow the Lochs into the darkness of the seas. So, they decided that if they couldn't police them, they would just kill them. With their allies all over the world, API developed a murderous biological agent that could survive in salt-water and would only adversely affect the Lochs. Then they poisoned the sea and waited. That was 1947. API would not see a single Loch until 1955, when Agents investigating reports that the NVA was working with Xenos stumbled upon a small group of Lochs on a deserted stretch of river. From there, formal contact was made with the Lochs. And while their governments were hesitant at first, they eventually did open diplomatic contact with the API. For while API had experienced almost a decade of peace, the Lochs had endured an apocalypse. Over 90 percent of the Loch population had died within a year, and their whole society had plunged into anarchy, into a civil war that was only just winding down. API used threats of another virus to make an agreement with the Lochs, and since then, the only Loch attacks that have occurred have only ever come from Lochs not associated with their governments. Or at least, no one has ever proved they weren't just private citizens acting of their own accord. But make no mistake, for despite the diplomacy and the fact that API send observers to the Loch state-houses, know that they loathe us. So in case you're wondering, this is why all senior agents tell you to avoid the beach. Threat Level: 6-4. Lochs are limited only by their numbers. But disregarding that, they are strong, six-foot humanoids covered in natural humanoids with excellent night vision, natural armor, intelligence to match humanity, and the will to kill as many of us as possible. Luckily, no Loch cells have ever obtained any WMDs or artifacts of significant magical power. At least, not yet. - Do not kidnap human women or attempt to breed with them. - Failure to do so will result in extermination. Mucks have existed for a very long time. No one exactly knows for how long. They lived apart from humanity, feeding on natural radiation, pollution, and other things. Since they lived so far from us, no one really noticed them until recently, when they began colonizing the sewer systems of major cities. First contact was made in the middle of the 20th Century, and many Mucks were surprised to find that Humans were intelligent. Since then, Mucks have become an accepted part of the Masquerade. They can hide in plain site, and rarely go near humans, so they are relatively unaffected by the information Blackout. Mucks don't seem to have any society or overall culture, though they are very social. Mucks tend to either live in small "family" groups, or socialize with others who pass by them often. Mucks are very, very difficult to damage, due to their gooey bodies, though magic can kill them. Muck culture varies extremely by region, but they are all usually quite friendly, hospitable, and willing to submit to the Authority of API. However, all Agents should still make all effort to be polite and hospitable with Mucks. 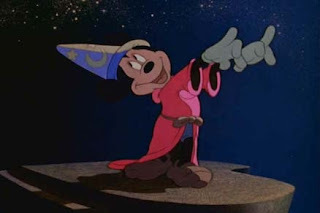 For while the vast majority of Mucks are genial and even kind-hearted, some are not. And those evil Mucks are a terrifying force. 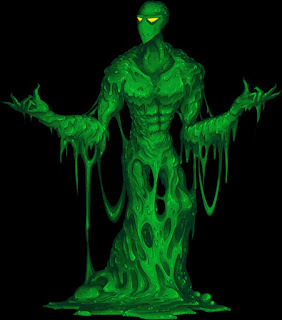 For an evil Muck can turn their natural gooey body to their advantages. Mucks can selectively harden and stretch their bodies, as well as being able to partially liquify and slip under doors or through tiny spaces that no living creature should be able to fit through. And if that wasn't bad enough, most weapons simply do not hurt them at all. Some Agents have even reported that their Semblances were useless against Mucks. Threat Level: 6. Mucks are not a great danger, whether individually or collectively. But a single rogue Muck can do a great deal of damage, and if they escape, can plague the world for generations. - Do not talk to people who do not have permission to know about you. - Failure to do so will result in the extermination of those who should not know. If you're playing a Gary vs Monsters game, your players won't have access to information API has carefully hoarded over the decades. So here's what the players can find out without doing huge amounts of research, breaking into top-secret government databases, or interrogating someone who would be in the position to know. - And cruises, don't even get me started; if you Know and you go on a cruise, you're asking to get attacked. - If they're near, odds are you are close to a large amount of pollution, radiation, or other nasty stuff.